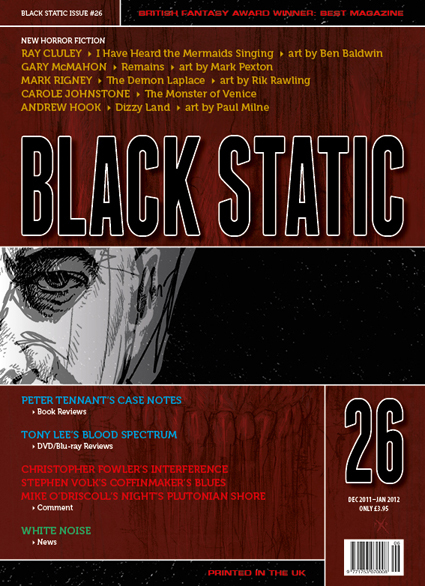 It's day two of the Travelling Theatrical Tour and the second stop on our journey is the Black Static Blog over at TTA Press. In today's post "The Travelling Theatrical Tour: Freedom" I talk about every procrastinating writer's best friend. Well my best friend. I hope you'll check it out. Black Static (and its sister magazine Interzone) are two of my favourite magazines. In fact, my favourite short story of 2011 is Black Feathers by Alison Littlewood which appeared in issue 22. They've also published work by Ramsey Campbell, Ray Cluley, Simon Bestwick, Christopher Fowler, Simon Clark, Barbara A Barnett, Sarah Pinborough, Gary McMahon and a gazillion others. Though you probably already know that. Note to self: subscription is due next month. Many thanks to Peter Tennant who made the TTA visit possible. I'm a huge fan of Pete's personal blog - one of the funniest on the web. Or maybe I have a similar sense of humour. If you haven't got it bookmarked already, you should do so now. Inspiration at Deborah Walker's blog. Wise words. I went a bit overboard and removed the internet entirely, which certainly helped with writing production. Problem is, now it means I can only read everyone's wonderful blogs and do my research (and watch Youtube)when I'm at work. And I suspect I'm supposed to be working then. Oh, and did the blindfold and liquorice Allsort involve a describing activity of some kind, or shouldn't I ask??? I don't think I'm ready for Freedom, quite yet. I love my slack ways. Thank so much for guest blogging, on my site. It was a fabulous success. Come back any time. I'm impressed, Ray. I don't think I'll ever be brave enough to remove the internet entirely. I'm going to leave the blindfold etc to the imagination. You get plenty of writing done without it, Deborah. Thanks again for inviting me along. Wow, Cate. Great post. And I need to download Freedom, asap. Many thanks Cate for an entertaining and informative post. And Ray, when I asked about the blindfold and the Liquorice Allsort she gave exactly the same answer, that she'd leave it to my imagination. I'm now wondering where to send the story as I'm not at all familiar with those type of markets. Already checked Cate, and I can't find a single publication that's open to fiction about the more obscure forms of freemasonry. Cate, thanks for the writing advice and the Freedom suggestion. Since I work, my time is limited and I'd rather write than waste that time. Now, I wonder what other rabbits you have in your hat. Pete, how'd you know it was something to do with the Freemasons? Where you there? Damn, I'm in trouble now. I only keep rats in my hat, Jeff. I waste far too much time so Freedom is a godsend. They welcome all sugary and chocolate treats, Ray. Ray, you're getting them confused with the Illuminati. Cate, I was the one dressed as Bertie Bassett.